Gloria Fowles was born in Newark, New Jersey, to Daniel Fowles and Queenie May Proctor. Her grandmother lived nearby and was involved in her upbringing. "There was always music in our house", Gaynor wrote in her autobiography, I Will Survive. She enjoyed listening to the radio, and to records by Nat King Cole and Sarah Vaughan. Her father played the ukulele and guitar and sang professionally in nightclubs with a group called Step 'n' Fetchit. Her brothers sang gospel and formed a quartet with a friend. Gaynor was not allowed to sing with the all-male group, nor was her younger brother, Arthur, because he was too young. Arthur later acted as a tour manager for Gaynor. The family was relatively poor, but Gaynor recalls the house being filled with laughter and happiness, and the dinner table being open to neighborhood friends. They moved to a housing project in 1960 and Gloria grew up as a tomboy. "All through my young life I wanted to sing, although nobody in my family knew it", Gaynor wrote in her autobiography. Gaynor was a singer with the Soul Satisfiers, a jazz/R&B music band, in the 1960s. She recorded "She'll Be Sorry/Let Me Go Baby" (for the first time as Gloria Gaynor) in 1966, for Johnny Nash's Jocida label. Her first real success came in 1975 when she was signed to Columbia Records by Clive Davis. The fruit of that was the release of her album Never Can Say Goodbye on Columbia Records. The first side of the album consisted of three songs ("Honey Bee", "Never Can Say Goodbye" and "Reach Out, I'll Be There") with no break between the songs. This 19-minute dance marathon proved to be enormously popular, especially at dance clubs. All three songs were released as singles via radio edits and all of them became hits. The album was instrumental in introducing disco music to the public, "Never Can Say Goodbye" becoming the first song to top Billboard magazine's dance chart. The Jackson 5 cover was successful on the mainstream Pop Charts as well, peaking at #9, and on the R&B Charts, reaching #34. It also marked her first significant chart success internationally, making it into the Top 5 in Australia, Canada, Germany and the UK. The song would go on to be certified silver by the British Phonographic Industry, and subsequently gold in the US. Capitalizing on the success of her first album, she quickly released her second album, Experience Gloria Gaynor, later that same year. Some of her lesser-known singles, due to lack of recurrent airplay — including "Honey Bee" (1974), "Casanova Brown" (1975), and "Let's Make A Deal" (1976), as well as her cover of The Four Tops' "Reach Out, I'll Be There" (which also became a #14 hit on the UK Singles Chart) — became hits in the clubs and reached the Top 5 on Billboard's disco charts. Many charted on the Hot 100 and R&B charts as well, with songs like "(If You Want It) Do It Yourself" - a #1 disco hit - peaking at #98 on the Pop Charts and #24 on the R&B Charts. Her cover of "How High The Moon" topped the US Dance Charts, and made the lower parts of both the Pop and R&B charts, as well as achieving some international chart success. After her 1976 album, I've Got You, she shifted from her hit production team, to work with other productions. Since then, Gloria Gaynor had recorded some 16 albums including one in England, One in Germany, and 2 in Italy. In the next few years, Gaynor released the albums Glorious and Gloria Gaynor's Park Avenue Sound, but would only enjoy a few more moderate hits. However, in late 1978, with the release of her album Love Tracks, she climbed the pop charts again because of her song "I Will Survive". The lyrics of this song are written from the point of view of a woman, recently dumped, telling her former lover that she can cope without them and does not want anything more to do with them. The song has become something of an anthem of female emancipation. Just as importantly, Time Out New York listed it as the number 1 gay anthem of all time. Interestingly, the song "I Will Survive" was originally the B-side when Polydor Records released it in late 1978. The A-side, a song called "Substitute", then a recent worldwide hit for South African girl-group Clout, was considered more "radio friendly". Boston Disco Radio DJ Jack King, turned the record over and recalls being stunned by what he heard. "I couldn't believe they were burying this monster hit on the B-side", says King. "I played it and played it and my listeners went nuts!" This massive audience response forced the record company to flip the songs, so that subsequent copies of the single listed the more popular song on the A-side. King was honored at New York's "Disco Masters Awards Show" for 3 consecutive years (1979–1981) in recognition of his relentless push of the song. The song was awarded the only Grammy Award ever for Best Disco Recording in 1980. As a disco number, the song was unique for its time by virtue of Gaynor's having no background singers. And, unlike her first disco hits, the track was not pitched up to make it faster and to render Gaynor's recorded voice in a higher register than that in which she actually sang. Most disco hits at the time were heavily produced, with multiple voices, overdubs, and adjustments to pitch and speed. "I Will Survive" had a much more spare and "clean" sound. Had it been originally planned and released as an A-side, it would almost certainly have undergone a substantially more heavy-handed remix. In late 1979, she released the album I Have a Right which contained her next disco hit, "Let Me Know (I Have a Right)", which featured Doc Severinsen of The Tonight Show fame, on trumpet solo. Gaynor also recorded a disco song called "Love Is Just a Heartbeat Away" in 1979 for the vampire movie Nocturna: Granddaughter of Dracula which featured a number of Disco songs. In 1980 and again in 1981, Gaynor released two disco albums which were virtually ignored in the United States due to the backlash against disco, which began late in 1979. The album's singles barely registered on Urban contemporary radio, where disco music remained popular. In 1982, having looked into a wide variety of faiths and religious movements, she became a Christian and began to distance herself from a past she considered to be sinful. She would not release an album in 1982. In 1983, she released an album entitled Gloria Gaynor, in which she rejected disco for mid-tempo R&B and Pop style songs. The album contained a patriotic song called "America" as well as a new version of "I Will Survive". In this new version of "I Will Survive", she changed the lyrics of the song in order to advertise her recent conversion to Christianity. The words "It took all the strength I had not to fall apart" were changed to "Only the Lord could give me strength not to fall apart". The album was not a success in the Pop, Dance or Urban markets. This move proved to be a turn-off to all other than her devoted fans. Gaynor would achieve her final success in the 1980s with the release of her album I Am Gloria Gaynor in 1984. This was mainly due to the song "I Am What I Am", which became a hit at dance clubs, and then on the Club Play chart in late 1983/early 1984. "I Am What I Am" made Gaynor a gay icon. However, her career went into sharp decline following this hit. She mainly made her living outside of the US where there was never any disco backlash. 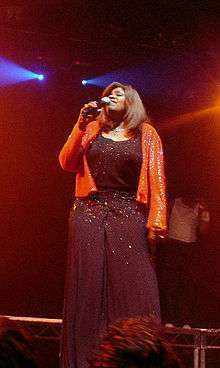 Her 1986 album, The Power of Gloria Gaynor, was almost entirely composed of cover versions of other songs that were popular at the time. The album was ignored, becoming a commercial failure. Gaynor's career received a revitalizing spark in the early and mid 1990s with the worldwide Disco revival movement. During the late 1990s, she dabbled in acting for a while, guest starring on The Wayans Bros, That '70s Show (singing "I Will Survive"), and Ally McBeal before doing a limited engagement performance in Broadway's Smokey Joe's Cafe. In 2001 Gaynor performed "I Will Survive" at the 30th Anniversary Concert for Michael Jackson. Gloria Gaynor returned to the recording studio in 2002, releasing her first album in over 15 years, entitled, I Wish You Love. The two singles released from the album, "Just Keep Thinking About You" and "I Never Knew", both topped Billboard's Hot Dance Music/Club Play. Both singles also secured moderate to heavy Dance format radio airplay. The latter song also charted #30 on Billboard's Adult Contemporary chart. In 2004, Gaynor re-released her 1997 album The Answer (also released under the title What a Life) as a follow up to her successful album I Wish You Love. The album includes her popular club hit "Oh, What a Life". In late 2002, Gaynor appeared with many R&B stars on the "Rhythm, Love, and Soul" edition of the PBS series American Soundtrack. Her performance of the Disco hit "I Will Survive" and new single "I Never Knew" was included on the accompanying live album that was released in 2004. On September 19, 2005, Gaynor was honored twice when she and her music were inducted into the Dance Music Hall of Fame. She was inducted in the Artist Inductees category along with fellow disco legends Chic and Sylvester. Her classic anthem "I Will Survive" was inducted under the Records Inductees category. In January 2008, The American Diabetes Association named Gaynor the Honorary Spokesperson of the 2008 NYC Step Out To Fight Diabetes Walk. More television appearances followed in the late 2000s with 2009 appearances on The John Kerwin Show, The Wendy Williams Show, and The View to promote the 30th anniversary of "I Will Survive". In 2010, she appeared on Last Comic Standing and The Tonight Show. After almost 30 years of its release, Gaynor continues to ride the success of "I Will Survive", touring the country and the world over and performing her signature song on dozens of TV shows. A few successful remixes of the song during the 1990s and 2000s along with new versions of the song by Lonnie Gordon, Diana Ross, Chantay Savage, rock group Cake and others as well as constant recurrent airplay on nearly all Soft AC and Rhythmic format radio stations have helped to keep the song in the mainstream. Said Gaynor of her biggest hit in a 2012 interview "It feels great to have such a song like that because I get kids five and six years old telling me they like the song, and then people seventy-five and eighty. It's quite an honor." The song was revived yet again in 2015 for the movie The Martian, where the sound track is used at the end as the credits roll. Gaynor and her husband have been residents of Green Brook Township, New Jersey. Gaynor is a Christian and is currently recording a Contemporary Christian album which is planning to be released in late 2012. On May 16, 2015, Gloria Gaynor was awarded the honorary degree of Doctor of Music by Dowling College. ↑ Blanz, Sharla (2007-12-19). ""I Will Survive" singer Gloria Gaynor graduated from Southside High School in Newark". Njmonthly.com. Retrieved 2012-12-27. ↑ Daneff, Tiffany (July 17, 1993). "The Arts: The new gospel according to Gloria She survives, and prospers, but the queen of the disco has done with clubbing, writes Tiffany Daneff". The Daily Telegraph. ↑ Quigley, Elizabeth (April 9, 1996). "Disco's born survivor". The Scotsman. ↑ "Step Out: Walk to Fight Diabetes: New York City, NY". diabetes.org. ↑ Ask American Profile. Published in American Profile newsmagazine. January 29, 2012 edition. Page 2. ↑ "The Martian". IMDB. Retrieved 17 April 2016. ↑ Lustig, Jay. "Gloria Gaynor serenades soldiers oversees with new holiday song", The Star-Ledger, December 11, 2008. Accessed March 6, 2013. "Gaynor, 59, grew up in Newark and now lives in Green Brook." ↑ "Gloria Gaynor". Dowling College. Wikimedia Commons has media related to Gloria Gaynor. "All I Need Is Your Sweet Lovin'"
"Stop in the Name of Love"